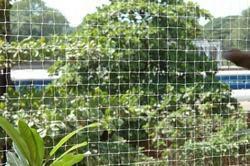 Supported by our experienced professionals, we are engaged in manufacturing, supplying and exporting Bird Proofing Net. The bird proofing offered by us is manufactured according to the norms and standards of the industry by using quality-tested material and employing modern machines. All these products are monitored at the production stages by a team of deft experts, in order to maintain their quality standard and eliminate defects, if any. These bird proofing are highly appreciated by the customers for their easy installation, longer life span, seamless finish and tough construction. Backed by profound knowledge of market demands, we bring forth the best Bird Proofing Net. Weaved with high precision using supreme quality co-polymer nylon, these nets prevent entering of bird in buildings without harming them. Breeding of birds in residential complexes and others can cause lung diseases and respiratory infections. Furthermore, to cater to the divergent demands of the clients, we offer these birds in different colors and a mesh size of 0.75", 1" and 1.25" square. We are known as one of the leading supplier of Nylon Knotless Nets Bulk Exports. Looking for Bird Proofing Net ?